Pequenas cidades da Sicília trazem vistas para o mar, história medieval e antiga e cultura vibrante. Esta excursão de dia inteiro visita as cidades de Taormina, Savoca e Castelmola em um pequeno ambiente de grupo. Sua primeira parada é a medieval Savoca e seu Bar Vitelli, onde foram filmadas cenas de O Poderoso Chefão . 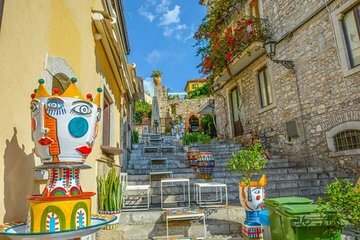 Em seguida, você vai explorar a cidade costeira de Taormina, seguida pela cidade de Castelmola. All 9 of us enjoyed this tour; learned much about these areas of Sicily. Tony and Flo were excellent guides with lots of knowledge to share! Iorge was our guide. There were 5 people. Iorga was an excellentguide. He was passionate about showing us all the important sites. He also gave us lunch! We really enjoyed Savoca, the most,and Castgelmola, as well. Taormina was very touristy, with shops, mostly, and everything there was very pricey. We just walked through the town and met our guide to leave. Was interesting seeing three small cities but a lot of time is wasted on the “godfather locale “Taormina is not worth a Saturday visit .. so crowded you can’t move . The lunch was a cute idea with the variations in panini but there should be an actual lunch option. Sitting on the steps of a church isn’t comfortable for most people . What do you do if it rains?We had the fun of watching a wedding in Savoca . Jorge was a very attentive guide and tried to involve everyone which isn’t always easy with a varied group of ages and interests.